Want to be a member of 10 minutes from hell? Re: Want to be a member of 10 minutes from hell? Welcome, Teyr! We certainly could use all the help we can get. There are not a lot of expectations that come with group membership. If you change your mind on wanting to join let us know. In the meantime, it is good to have you helping out in Molebank. There's really no need to worry about me changing my mind, however. I came here after thinking it through, after all. good to see you! Any help is good, formal or otherwise. Hope to see you in St E's! http://www.urbandead.com/profile.cgi?id=265169. pault former member of the DHPD and founder of the GHPD requesting to join up. Happy to see your interest. I saw you in St. E's. Just want to make sure that you are clear about our not killing other survivors. We are kind of obsessive about it even to the extent of not retaliating against serial PKers. Settle in with a cup of tea and give that a good long think and then let us know if you're still up for it. Hope you decide to come aboard. Hey guys, just a newbie here... Been playing a month or now and think I have finally got the basics to surviving down at least! Only one death so far! Anyways, I have been in Moletown/St. E's the whole time with you guys and was wondering if I could become a member? No PKing, no zerging... Just good old casual, zombie surviving fun! Hello! I'm S1R10N! Actually my third account, I keep losing the passwords. 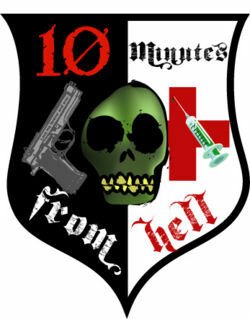 Anyway, I first learned about 10MFH when I ran into the horde that's currently smashing the 'cades at St. Elisabeth's Hospital and went inside. Still raising AP to get some more ammo. They could use some help, last I heard 2 still inside. Anyway... sorry for rambling. I'd like to join because I've never been in a group before and this seems like a good one to start with! (*) Sorry 'bout that, couldn't post it. Space is between the two /'s.